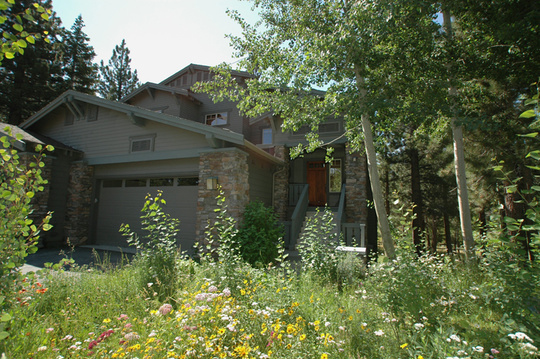 Listed below and updated daily from the MLS are condos for sale in Timbers, a condo development located in Mammoth Lakes, CA. And, be sure to register for a free account to automatically receive email listing alerts whenever new Timbers condos hit the market in Mammoth Lakes, CA, that match your specific search criteria. The Timbers luxury townhome development is located at 1000 Sierra Star Parkway at the 17th Fairway of the Sierra Star championship golf course. Many of these townhomes offer a peaceful forest setting with a convenient location close to the Village at Mammoth and town. The complex has convenient Green line shuttle access to the ski slopes located at Meridian Blvd. and Sierra Star Parkway. Built in 2000, this 32-unit complex features two different floor plans to choose from: 3-bedroom & den, 4-baths with 2,222 square feet; and 4-bedroom, 4-bath with square footage ranging between 2,641 and 3,000. All units are 3-story townhomes and have private attached 2-car garages, laundry rooms, gourmet kitchens and large decks with spas, propane gas log fireplaces, forced air heating, and enjoy the prime golf course location. Monthly HOA dues include: Snow removal, building maintenance, landscaping, water, trash, sewer, common area insurance and insurance for the structures. The monthly dues range between $581 and $601 and are prorated according to unit size.